The four oblong panels—replicas of friezes from the Pergamon Altar—are displayed on two tables on the main staircase of James Duke House, a robber baronial Neo-Classical pile built on the corner of 78th and Fifth Avenue in New York for the creator of the American Tobacco Company. 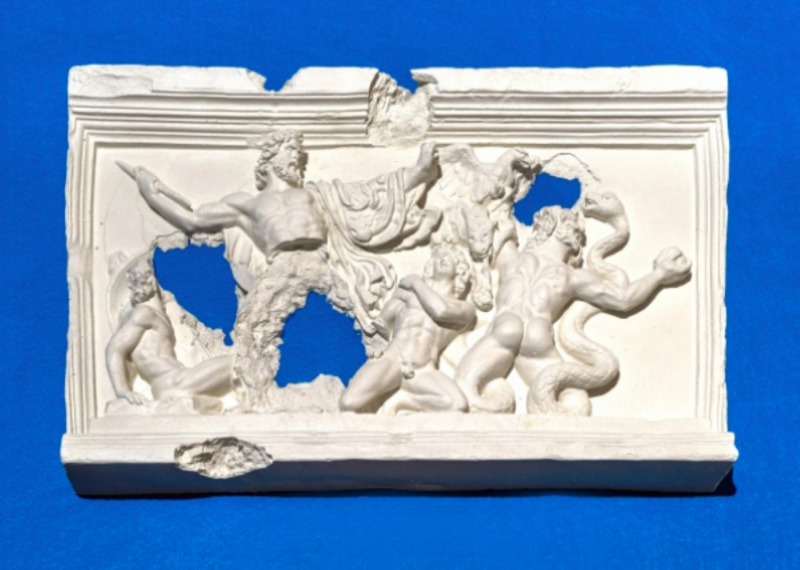 The first panel shows Zeus waging war on the giants and at 13 by 18 inches, it is petite compared with the original Pergamon altar, now in Berlin, but it pulses with energy. The second panel? The same, but it’s defaced by casts of ISIS bullet-holes. The third is as holey as Gruyere cheese and the fourth is meaningless bits of stuff. Welcome to our new world. Piers Secunda, the artist, didn’t make the Pergamon Alteration as a conceptual prank, as witty faux Fontana. A Londoner, he focused his attention on the scars of war that can still to be seen on two museums, the Victoria &amp; Albert and the Tate. Secunda went to Pudong, south of Shanghai, where he and a friend talked their way into a People’s Liberation Army firing range. Secunda was carrying some white sheets of industrial floor paint. The soldiers, after pot noodles had been consumed, tea drunk, and cigarettes smoked, allowed Secunda to position the sheets of paint behind a set of targets. interesting. It reflected the way that violence is glamorized by the media and marketed a certain way by Western entertainment. I realized I needed to think about how to take this further. And very swiftly I concluded that if I wanted to turn the volume up to full on the intensity of this new potential body of work that I had to go to the place where the most significant people were making bullet damage. And for me that was the Taliban. So to Afghanistan. In 2010 Secunda got in touch with one Sardar Ahmed Khan, who he had learned could be relied upon to connect Western media with Taliban forces. Khan emailed to inquire whether he had it correct, that Secunda wanted to be taken to the bullet-holed walls that signified a suicide bombing, that he would take molds there, and duly depart? Who was on the other side? “Anybody who got in his way,” Secunda says.